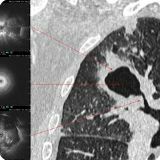 Welcome to the WABIP Academy Image Library, a resource for bronchoscopic images of airway and pleural abnormalities, contributed by members of the WABIP and others around the world. New images are constantly being added to this section, so please visit this page regularly for updates. 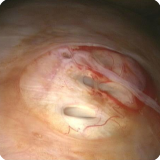 Image courtesy of Ilias Porfyridis, M.D. 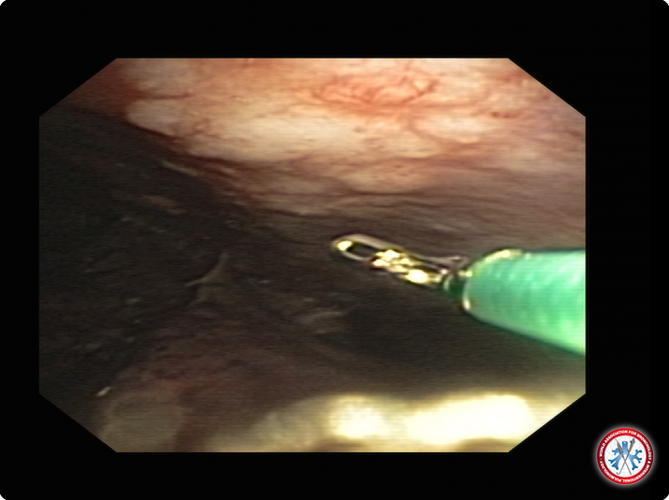 Refractory hydrothorax appears when there is no response to sait restriction, diuretics and paracentesis and its management is not well established. 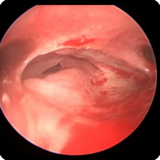 Videothoracoscopy is a promising therapy that permits the detection and closure of diaphragmatic defects, and when used with talc pleurodesis resulted in long-lasting control. 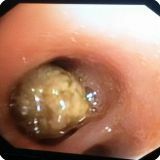 Image courtesy of Salvato Feijó, M.D. 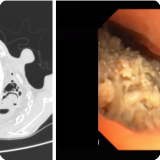 24-year-old female presented with complaints of massive hemoptysis since 1 year off and on. She was a life-long nonsmoker and there was no history of other illnesses. 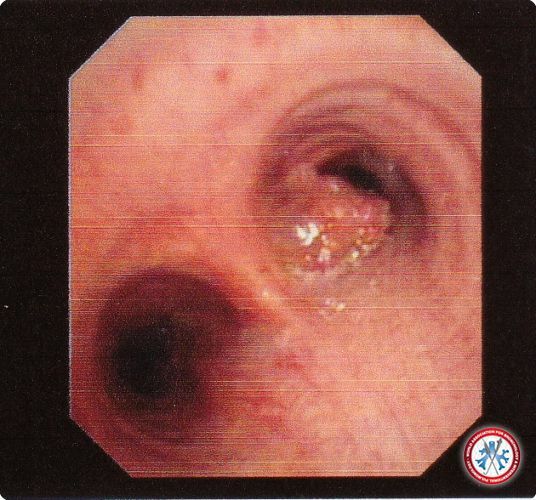 Sputum for acid-fast bacilli was negative. Sputum culture for bacteria and fungus was negative. The patient's chest x-ray and HRCT thorax were normal. 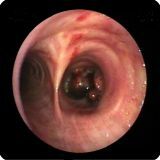 Flexible fibreoptic bronchoscopy was performed to evaluation of the airways. 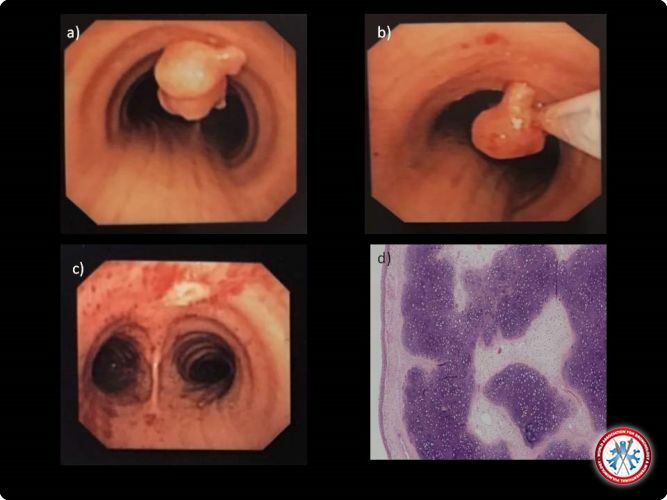 The bronchoscopy revealed an irregularly shaped yellowish mass of approximately 2-cm size partially obstructing the right middle lobe bronchus . 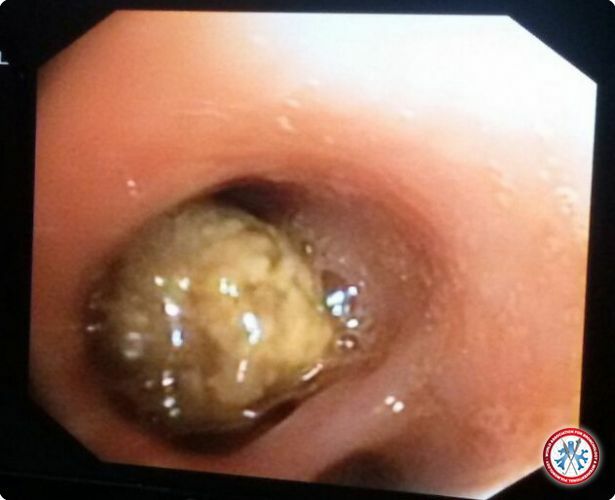 The mass was lodged firmly to the mucosa and couldn't be dislodged. 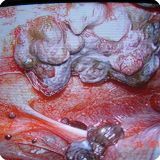 A few biopsies were taken and the histopathology revealed it to be aspergilloma. A Migrating Foreign Body. 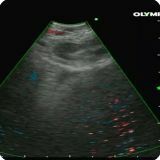 Patient presented with right pyopneumothorax with hyperdense lesion seen within the distal bronchus intermedius. 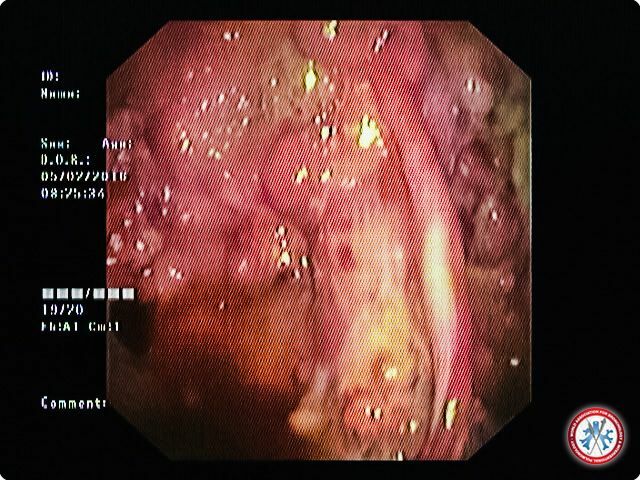 Bronchoscopy noted granulation tissue at distal bronchus intermedius (Panel B) with no intraluminal lesion. 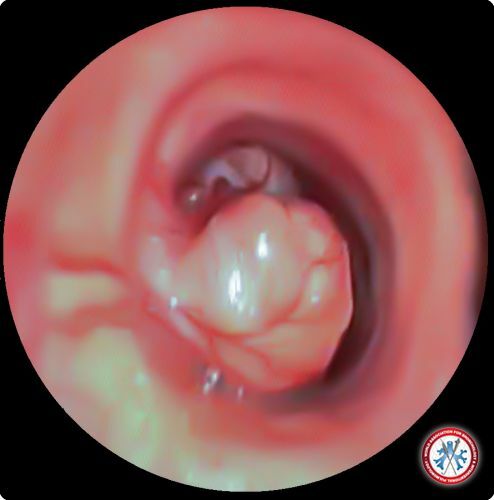 Further examination noted the foreign body was migrated to the left lower lobe bronchus (Panel C) which was removed successfully via rigid bronchoscope. Patient revealed a prior history of choking on chicken bone. Anatomy of A Malignant Pulmonary Cavity. 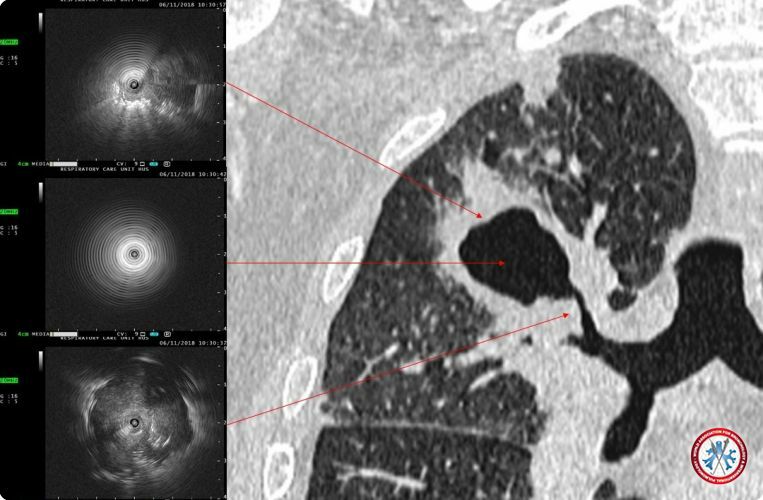 Radial endobronchial ultraosund (R-EBUS) image of thick walled pulmonary cavity at various contact point. Biopsy proven adenosquamous carcinoma of the lung. 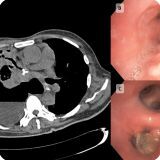 Huge pulmonary Aspergilloma: a crescent of air above a truffle-shaped mass that appeared mobile inside a neoformed cavity from a destroyed left upper lobe. 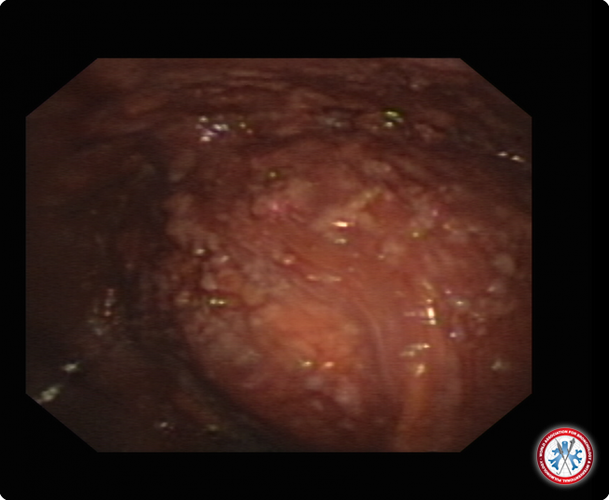 A mulberry-like mass at the proximal part of right principal bronchus, partially occluding the lumen. A young patient was referred to us for complete left lung collapse after completion of anti tuberculous therapy. He demonstrated microbiological and clinical improvement despite the worsening radiographic changes. 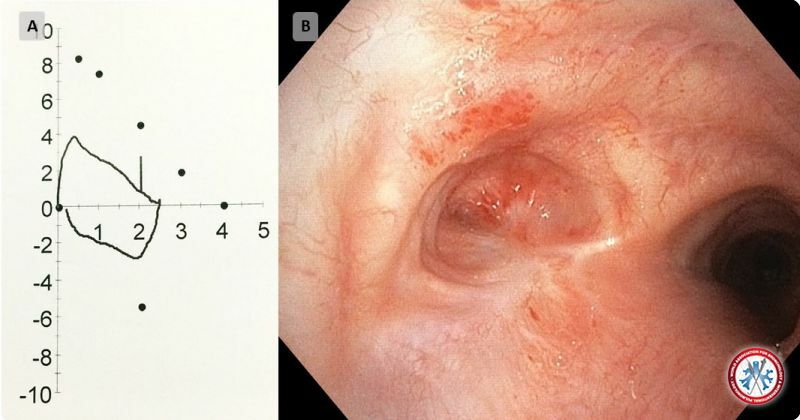 Spirometry show biphasic flow volume loop and bronchoscopy noted an obliterated left main bronchus ostium with whitish fibrotic plaque consistent with post tuberculosis changes. Subsequent computed tomography of the chest shown total left lung destruction which was not feasible for airway intervention. Cupid's arrow-EBUS-TBNA for 4R. The patient was diagnosised as NSCLC with biopsies from TBLB and TBNA. The picture shows the process of EBUS-TBNA on 4R lymph node. 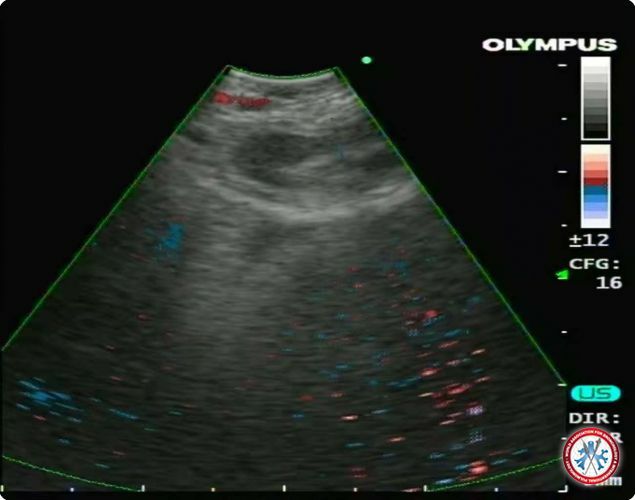 On the right upper site of the picture, we can see the needle inserted into the heart-shaped lympn node, so we call it Cupid's arrow. 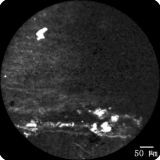 Sarcoidosis- confocal image of the right upper bronchial mucosa. 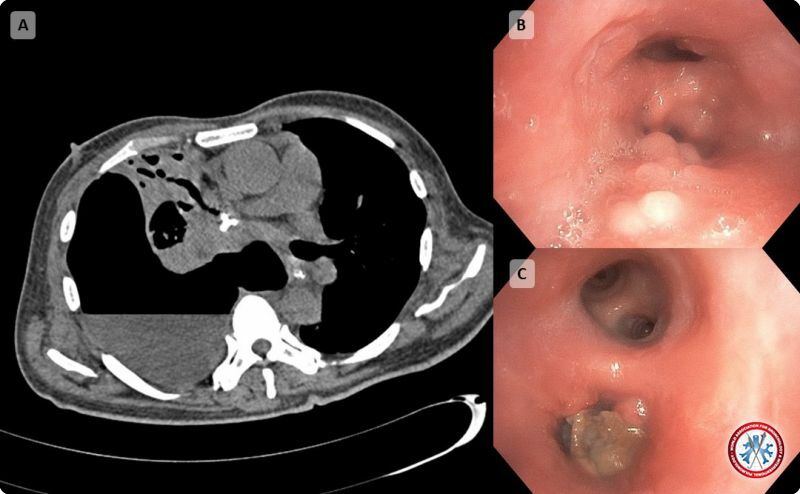 The patient was diagnosised as Sarcoidosis with biospies from the airway wall. 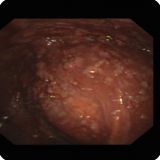 The picture is one of the confocal images of the right upper bronchial mucosa, which diplays highlight spots and disorderly arranged fibers of the airway wall under the confocal probe. 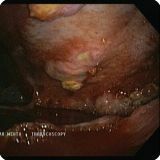 Thoracoscopy images of left pleural cavity with parietal pleura studded with large irregular nodules with yellowish tip - histopathology shown clear cell renal cell carcinoma - Fuhrman grade III. A 66 years old male patient with history of left nephrectomy 2 years back due to renal cell carcinoma, presented with left sided pleural effusion - and was found to have isolated left pleural metastasis of clear cell renal cell carcinoma. 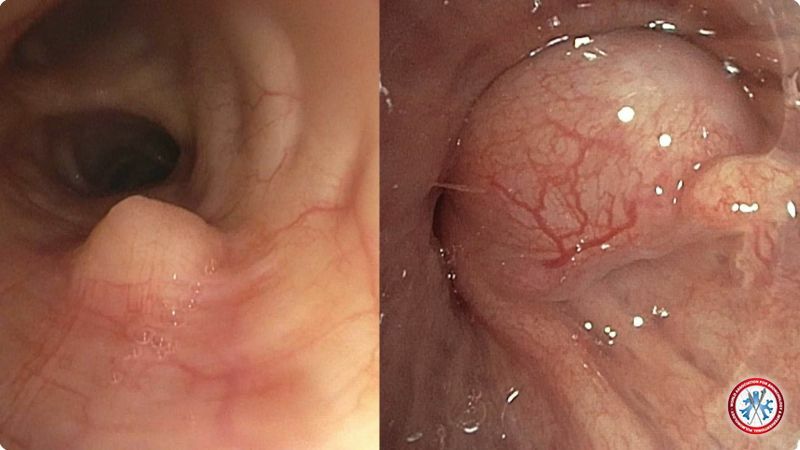 Pleuroscopic images demonstrate bloody pleural effusion and multiple small round red nodules on the diaphragm (A) and parietal pleura (B). Multiple small holes (*) are also discovered on the diaphragm (C). 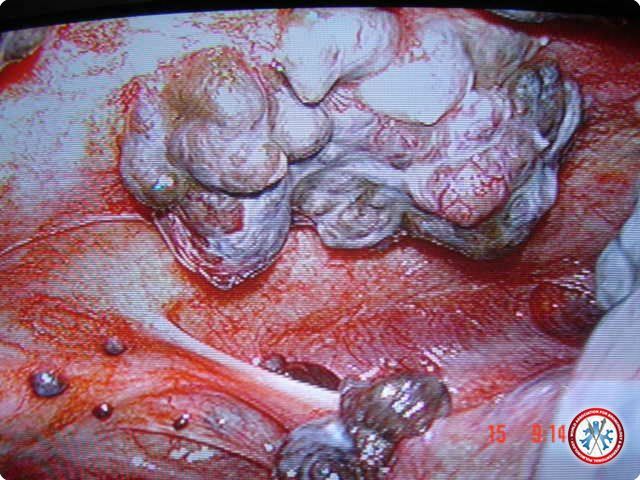 The histopathology of the nodules shows proliferative endometrial-typed glands surrounding by endometrial stroma which is covered with mesothelial cells (D). 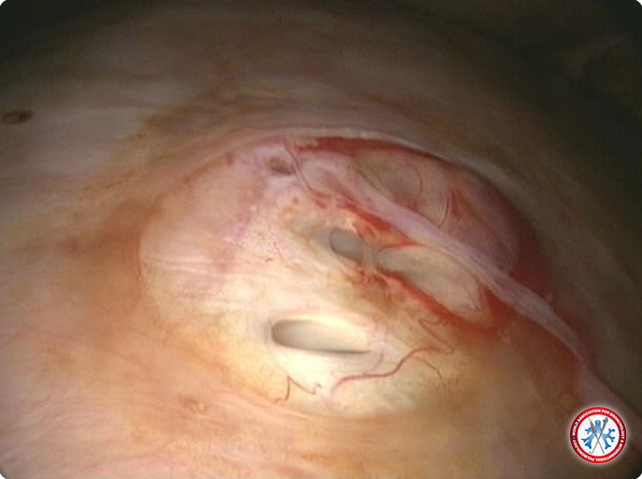 Thus, the diagnosis of pleural endometriosis is made by flex-rigid pleuroscopy. 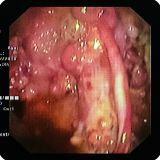 65yrs male patient with left sided encysted pleural effusion under gone thoracoscopy biopsy showing multiple grape like vascular nodules on parietal pleura. 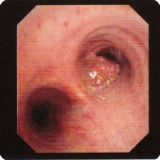 Biopsy revealed Squamous Cell carcinoma.